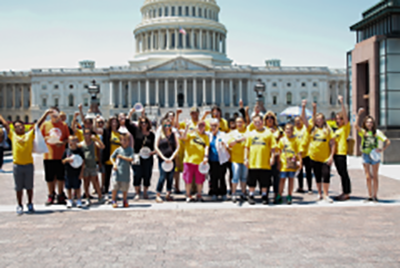 Earlier in May, we joined our sister organization CPD Action (CPDA) to launch our Summer of Heroes in DC campaign, focused on organizing weekly actions led by our affiliates including mobilizations, lobby visits, and other federal fighback advocacy efforts. As Congress was returning from its July 4 recess, CPD/CPDA brought hundreds of grassroots leaders to Washington, DC to raise our voices and take action on issues of critical importance to our communities. On July 12, over a hundred youth came to DC to speak out against the the school-to-prison-and-deportation pipeline. Youth from CPD/CPDA affiliates Make the Roads New York and Connecticut were joined by allies from the Urban Youth Collaborative, the Advancement Project, and Communities for Just Schools Fund. Since the Federal School Safety Commission formed by the Trump administration in the wake of the Parkland school shooting has shown little interest in actually listening to youth of color, the young people brought their concerns directly to the Department of Education (DOE) in a “People’s Listening Session” outside DOE headquarters. With calls for “counselors not cops,” the youth denounced the presence of police in schools as a misguided approach to school safety, and defended Obama-era guidelines addressing racial bias in school discipline. The young people also held 16 meetings with members of Congress encouraging them to divest from policing and deporting young people, to invest in students and teachers, and to preserve the civil rights of young people. The action was covered by Politico. We urge you to support CPD’s Summer of Heroes program by making a donation today.